In this age of classroom shootings, many are looking for barricade locks - a cheap and easy stopgap to bolster door security. 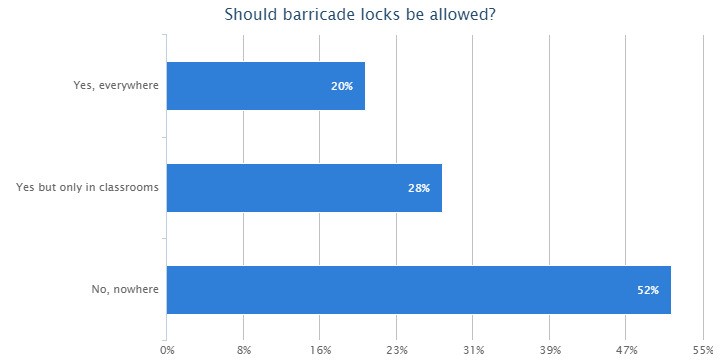 Critics condemn barricade locks as dangerous and even deadly because they do not satisfy basic building codes, while proponents claim their simple operation and cheap price outweigh the risks. Access dealers, worried parents, and school administrators alike have waited to see if building code exemptions would be made. The world's biggest building code group have weighed all these arguments, and made clear their position in the upcoming 2018 edition of international building codes. Inside, we examine the changes, the proposed code, and where current barricade locks run foul. Egress requirements apply in that 'no special knowledge or tools are required to unlock them, and unlatching can be done in a single movement (per IBC Section 1010.1.9). Modifications shall not be made to listed panic hardware, fire door hardware or door closers. We examined this barricade lock series, and a range of other similar products in our Barricade Locks - Pros vs Cons note. Because the majority of these devices are little more than improvised hardware, prevailing concerns and objections to their use still apply in the scope of the new language. IBC language changes are important, because they directly compose architectural laws in many areas of the world. Especially for systems like access control, where many products might unintentionally contribute to injury or death of building occupants when used incorrectly, codes like IBC are important to observe to maintain life safety. If products do not meet these codes, punitive fines, building closure, and urgent corrective actions can be enforced by courts and police. For the 'classroom lock' market, IBC requires all products or devices for securing doors must satisfy code requirements designated by version or year. While the 2018 IBC version will not be ratified as the authoritative code in all areas immediately, in three to five years it will be the most widely used and referred to version in North America and many part of the world. Indeed, opinions are mixed nearly 50/50 between continuation of the ban and outright or conditional acceptance in classrooms. In any case, IBC has upheld its former prohibition and shows no signs of changing in the future.